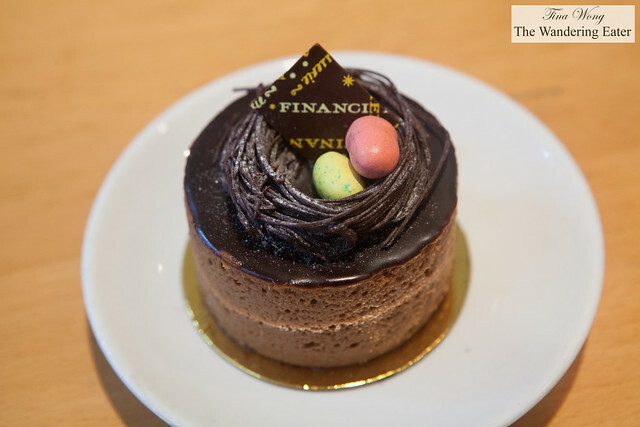 Easter is next weekend and those of you who need a few sweets on the table (and in New York City), Financier Patisserie is a solid option. They have multiple locations around Manhattan and the tasty sweets are reasonably priced. The Frasier cake slice is technically their year-round cake option but they made it spring inspired with the white chocolate strip with eye catching colorful print spring flowers. The cake itself is light and delicate from the almond macaron cake, mousseline, vanilla biscuit, vanilla buttercream and fresh strawberries. 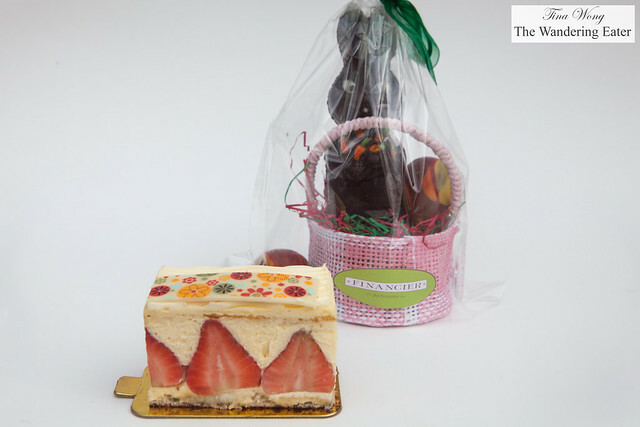 The Chocolate Nest cake (seen above with its cross section and the large 7-inch cake $32 at the header) and chocolate praline Easter eggs (seen at the header of this post; box of 5 eggs for $20) are for the chocolate lovers. 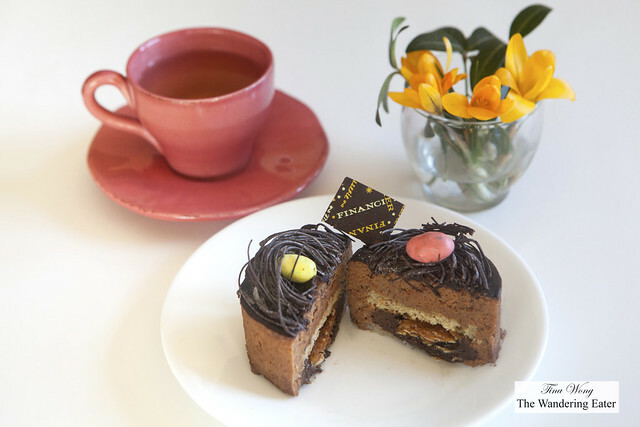 The chocolate nest cake is a hazelnut macaron cake, chocolate pastry cream, nougatine and gianduja mousse topped with chocolate glaze, chocolate nest and filled with chocolate eggs. It’s almost too precious to eat but it’s too delicious not to eat it! The chocolate praline eggs are great little sweet treats when you want a chocolate hit with some crispy texture from the praline. There was a Easter bunny basket filled with chocolate eggs wrapped in foil and two chocolate praline eggs ($15) but my little cousin set his sights on this basket and well, ran over to the table and knocked it over by accident. 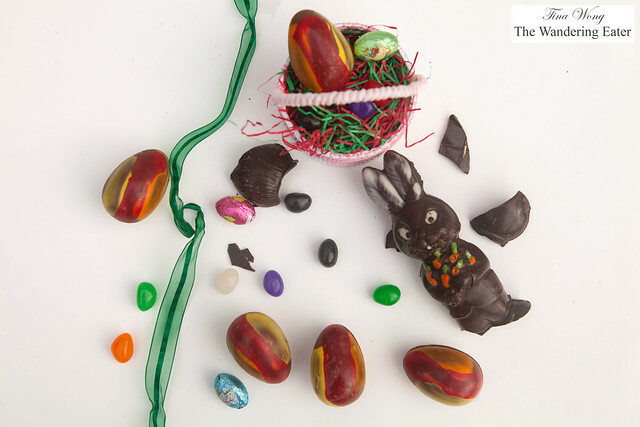 At least you know this basket will appeal to both kids and the kids at heart, like me, and we had a party with this chocolate bunny. The chocolates here are of high quality — not too sweet and has a creamy mouthfeel.